The String Academy consists of small group string instrument class instruction. Classes are held during school and after school in schools throughout the greater Birmingham area. We teach violin, viola, cello and bass to 3rd - 5th grade beginners. Students learn the basics of instrument performance and music reading. String classes are also offered during the summer for continuing students. No need to purchase an instrument - MOP has string instruments available in all sizes for inexpensive rental. 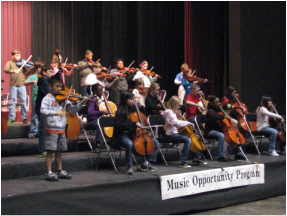 String Academy classes are offered in several schools in the Jefferson County School system. These classes are held during the school day. There is no charge for tuition. String Academy classes are offered in many different locations and are open to students throughout the greater Jefferson/Shelby County area. Contact us for more information about a string class program in your area! Private Instruction ... traditional private lesson instruction for students with artist teachers from the greater Birmingham area. One-on-one individualized instruction is the best instructional alternative for more advanced students and those youngsters graduating from the String Academy Division. Concerts, Recitals, Performances ... the joy of sharing music in public performance. Our students perform in solo and ensemble recitals, orchestra concerts, school concerts, and in their churches, at civic groups, and in their own schools. Click here to learn about our youth orchestras.